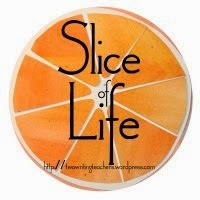 I'm slicing with the Two Writing Teachers community for Day Two of Thirty-One of the Slice of Life Challenge in March. Thank you Stacey, Tara, Anna, Betsy, Dana, Kathleen, Beth, and Deb. 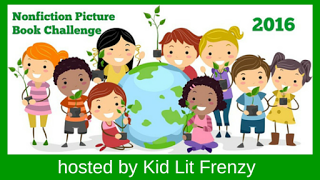 Thanks also to Alyson Beecher's Non-Fiction Picture Book Challenge at Kidlit Frenzy. It's a pleasure to discover new books where children can learn new things. This time, I'm writing about two books courtesy of PR By The Book whom I thank for sharing good books with me. The two following books have an interesting history. From the collaboration of a foundation in China, The Robert H. N. Ho Family Foundation, and the Design and Cultural Studies Workshop in Hong Kong, a program about living in the Forbidden City was created. Out of that, and working with The China Institute in America, the program and these books have been brought to an English speaking audience. These books, among others, will become special resources for students young and old who wish to know more about the Chinese culture. Both of them hold a lot of information, and it seems that some parts could have been broken into several parts, each suitable for different ages. 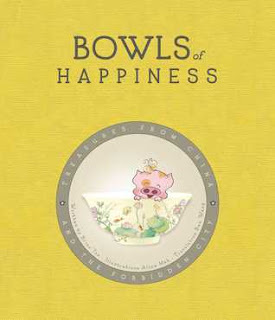 This is a fascinating book, with one part in story, and the second adding more information about the kinds of happiness found in the language, and photos of special bowls from the Palace Museum. In the sweet opening, “Between heaven and earth is a bowlful of happiness.” the reader has a taste of what is to come: a picture book for younger children. With a mixture of a happy welcome to “Piggy”, the new baby’s nickname with his pink cheeks and “Oink, oink, oink” of a cry, the story begins. In it, Mommy is introduced as a potter, and one bowl she makes has a piggy on it. She adds clouds, flowers, parrots and birds, other beautiful things from nature that also are happy to be included. It becomes the bowl of happiness for her little piggy. The second part offers an introduction of the sky and earth meeting to create all living things. It says: “People meet these natural wonders to create happiness.” There are pictures of bowls and the color and object meanings found on them. And there is additional information at the back. The final pages have a blank bowl where readers can decorate their own happiness bowls. I imagine that it could be copied so several could create the bowls. 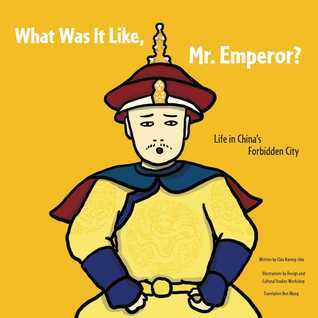 Illustrated throughout with graphic-style characters, sometimes with balloon speech asides, this book is filled with information from the beginning explanation of the five legendary emperors to the last, Emperor Puyi (ascended at the age of three), ordered out of the Forbidden City in 1924 when the imperial system of China officially ended. Much information included in this book, about ranks and symbols, certain emperors, their daily lives and important things they did. There are details about their wives and consorts, and brief bios of the emperors of the Ming and Qing dynasties. Information about the incredible amount of food expected to be served to the emperor, and his education. You learn some history, and some about the servants, their ranks and what they were allowed according to that rank. I’m sorry that there isn’t an index, but it might work well for students to read the book, marking certain areas or people that they wish to research further. It didn’t take me long to read. The illustrations are informative and entertaining. 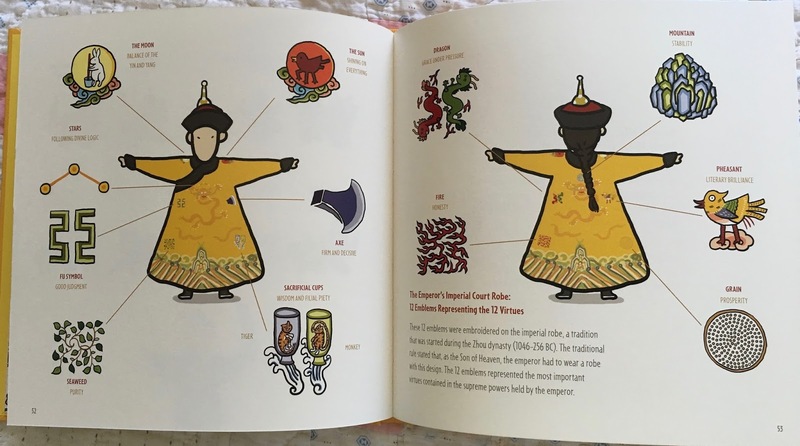 For example, there is a double-page showing the front and back of the Emperor’s Imperial Court Robe with twelve emblems that represent the 12 Virtues. And the illustrations with text can show a bit of humor. In an explanation of the responsibilities of a ruler, the phrase “Family and Country” is used, meaning the emperor must improve oneself before starting a family, then take care the family is happy, and finally he can rule an entire nation. It’s a clear explanation of expectations. Here is the illustration. The books are well done, a bit different than the approach of non-fiction books we usually read, but they will be good resources for a study of China. You're welcome, Beth. Hope you can find and enjoy them. Always great to have book recommendations Linda! Good luck at the dentist. Thanks, still not taken care of, but maybe by tomorrow? What great timing for me these books are. My husband in working in China and we are going to visit him this month. I love the idea of a bowl of happiness! You always share such intersting titles, thank you, Linda. I hope you will be able to visit the Palace Museum, Lee Ann. It sounds wonderful. Glad to have shared this right now! The bowls are also fascinating. I had no idea that each part added is a particular symbol. Nonfiction books sure have come a long way since I was in school. Maybe if there were more like these I would have a bigger interest in reading nonfiction. I know exactly what you mean. I remember those little books with encyclopedia-like text and a few black & white pics. Yes, n-f books are marvelous lately. I'd like to read the books. Hoping that your dental problem has an easy solution. Thanks, Terje. It's not over yet, but hopefully I'll find out more tomorrow. They're very different, and very interesting, Annette. Thanks. Those are both new to me! I appreciate finding books that can be used on a variety of levels - it's nice to see authors add a layer of ways to read books! They're quite interesting books, Michele. I hope that you'll be able to find them. Thanks. Love that you are collecting books as resources. We get so caught up in all the other mediums! Thanks for sharing, Linda! They're well done and so filled with information. Thanks, Melanie. What a wonderful pair of books, Linda - I have heard of neither, so off to Amazon I go! Hope they will be useful to you, Tara. Thanks. New books to me! Thanks for sharing! What Was it Like Mr. Emperor? looks like a must have. My kids this year love to linger in text, and I think they would really enjoy this one. Take care at the dentist. My least favorite part of health care. Prayers and wishes for an easy fix. Thanks, Kendra, my dental props are still not resolved, but I'm hopeful soon. 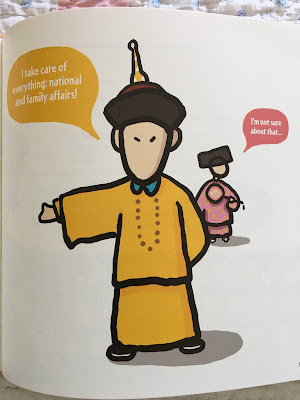 That Mr. Emperor book is so full of information and in a fun way. These both look terrific, Linda. Hope your dental work went well and you're not too uncomfortable. Thanks, Catherine, for enjoying the reviews and for the wishes. Still not resolved, but I hope soon. Hope you get relief soon. Look like interesting books - especially as they are about a country we should know more about. I'm always interested in the "rules", wondering how they came to be, & how others might see our "rules". They're fun books, Beverley. Thanks, Loralee. Hope you get a chance to read them. These books look unique and interesting. I discovered a new-to-me China book in September - A Single Pebble: A Story of the Silk Road by Bonnie Christensen. China was my favorite ancient culture to study in 6th grade Social Studies. Partly because of the time I spent living in Hong Kong. Off to see if these books are available at our library. I'll look for your book, too, Ramona. I didn't know you lived in Hong Kong. How wonderful you had that experience. Hope you can find these books!